This website is dedicated to identifying, preserving, and advocating for the art commissioned by Home Savings of America for its bank branches — murals, mosaics, sculpture and more. Anaheim, 101 S. Harbor Blvd. Buena Park, 7964 Beach Blvd. Garden Grove, 11922 Brookhurst St.
Los Angeles, 3731 Wilshire Blvd. (at Oxford) — reconstructed after original demolished? Compton, 1801 N. Long Beach Blvd (1958); now a stereo shop; epoxy over the murals is deteriorating and flaking off — threatened! San Jose Airport Terminal C, 1977, saved; Tony Sheets helped remove canvas mural. Dallas Mercantile Bank building mosaics and freestanding sculptures, 1950s, saved from demolition! Los Angeles, 3731 Wilshire Blvd. I’ll add the Wilshire address to the list. According to Chris Nichols, 350 Pine Ave in Long Beach used to be a Bank of American building. Here’s the one at West Portal and Vicente, SF. Thanks, Vance. There are some great Palomino ponies inside that location as well. The branch I remember from childhood is at Wilshire and Oxford, central LA, and is also now a WaMu (or successor). Nothing’s visible from outside, though. There’s an old HSL with beautiful murals on the corner of Sunset and Vine. Also one on the corner of Wilshire and Rexford in Beverly Hills. Thanks so much for setting up a great project — those locations truly are treasures. Thanks again! Those are great pages at PublicArtinLA.com. I will add them to the list. Santa Monica native here, I just started conversations with SM City Guv’ment about pushing for the mosaic and statues receive Landmark Status. The corner of 26th and Wilshire is slated for review in 2010. That’s great news — if I can be of use in any way, let me know. Pasadena Branch @ Lake and Colorado is now being converted to CHASE and they were about to paint over the mural. Stopped by alert Library employee. Cultural Affairs will follow-up to find a new home. Sculpture also. Thanks very much for the comment. I hope the works can be secured. If anyone else is reading this and knows of works under imminent threat from the Chase renovations, please let me know! 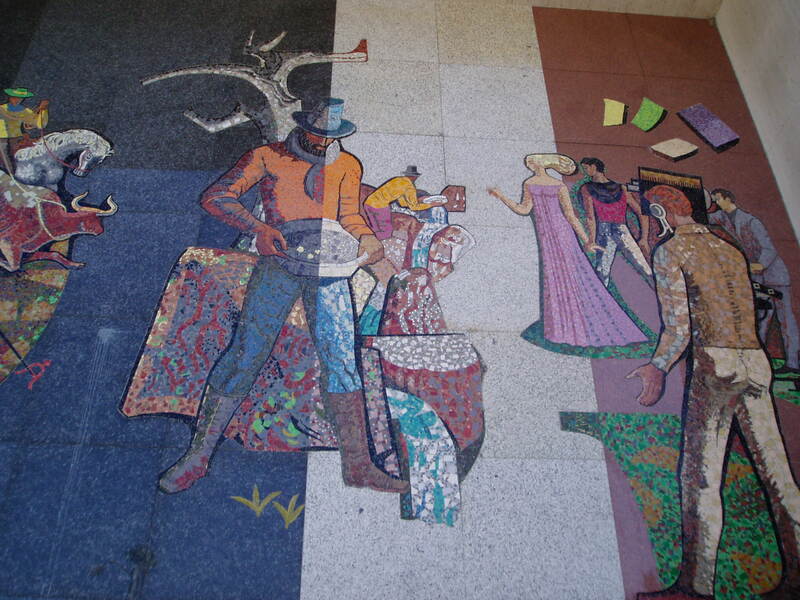 I have spoken with the JP Morgan Chase Bank public-relations folks in Los Angeles, and he said they are working to identify murals and mosaics, as they change over the brand, and to stay aware of this historic artwork in the community. I have also found a more complete list of the murals in the LA basin; I will be updating the list above with the building locations soon. I’ve linked my Lake Avenue, Pasadena blog to yours. We’re working on the fate of the Millard Sheets’ murals here at Lake and Colorado. Hello–is this still an active blog? In the South Bay, there are several former Home S&Ls that I think feature Sheets’ work (no one can confirm that the mosaics are his). One is the former Torrance City Hall (a picture is on my blog at http://historylosangeles.blogspot.com/2009/12/mosaic-monday-olde-city-hall-torrance.html). Home Savings occupied the building for awhile, then moved a few blocks away to a site on Torrance Blvd, which is now a Chase Bank. I have pictures of mosaics there too, not posted yet. At the foot of TOrrance Blvd in Redondo Beach is another bank–Chase or Wells Fargo, at 301 Torrance Blvd–with a beautiful mosaic of birds in flight over the entrance. If there is a serious effort afoot to save this artwork, I’d like to know about it–Thanks! Sorry–screwed up my own blog address. Yes, we are still researching the murals, and working to find and preserve them. Thanks for stopping by! Do you have any information on 13949 Ventura Blvd, in Sherman Oaks. Interesting frescos on the exterior of a later Home Savings branch. I can’t get a great look at them on GoogleMaps, but they do seem to follow in Sheets’ style, despite the newness of the building. With some quick photos, perhaps we can trace the connections. Are they a reinstallation? An homage? Something totally new, to blend into the Home Savings/WaMu/now Chase legacy? That would be great. I assume it does simply show a reverence for Sheets as the bank’s LA Valley “look,” but it will worth adding those artists, and perhaps the instructions they were given, to the project research. Do you know what Chase Bank in Northern Calif. painted over a Sheets mural? How awful! We are a family of Sheets cousins who are very interested in having his mural and other work preserved. He believed in art for the people, and a bank is the perfect spot. Or they should be repatriated. Thanks for your good site. If I can do anything to help preserve family artifacts or these threatened murals, please let me know! I will update the site as my research advances as well. 2010 has brought lots of great new contacts. 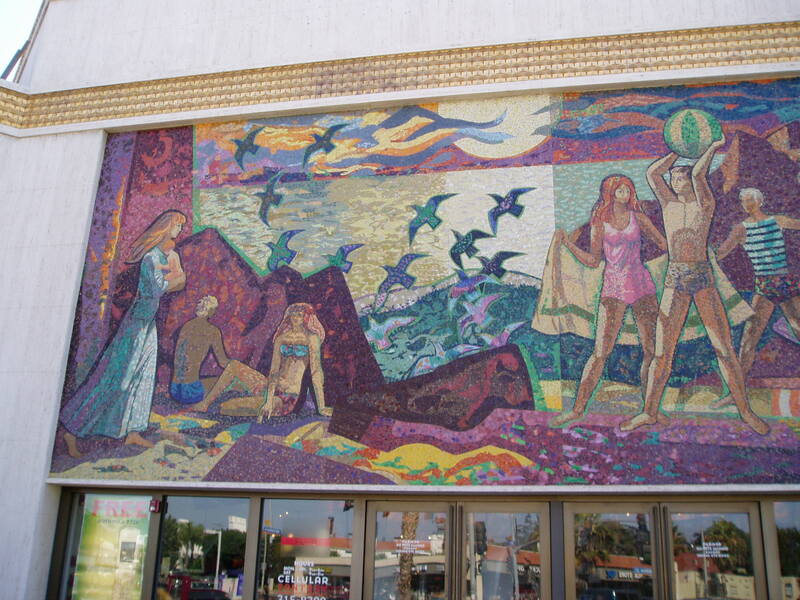 …and here we have good info on some San Diego and San Francisco mosaics and murals. Calling all Orange County contributors! Soon it is definitely time for a new front page — I’ll get to that this month, with any luck. Thanks everyone, and let’s keep working together to save this art, either in situ or in museums. I am the current Chairman of the Modern Committee of the Los Angeles Conservancy. We are presently exploring doing a Multiple Property Nomination of all of the Home Savings Buildings. I was wondering if any of you might be interested in participating? Yes, I would be happy to participate! Boxes 12-14 are specifically labeled Home Savings, and list all the cities. Thanks! The finding guide list does not seem complete – perhaps multiple branches in some cities are listed together. But I do plan to look into getting those records. The collection is available on microfilm reels 5676-5707 and for interlibrary loan. Adam, thanks for the comment you left on my story, “Millard Sheets mural of Rose Parade may be removed from Pasadena Bank”. The current placement is not at all what was intended when the mural was installed in the orginal Home Savings. I hope that in removing and reinstalling it elsewhere, it will actually be displayed properly. Please leave comments. I would also appreciate any info on Sheets artwork in Altadena. There used to be a Home Savings, but it was pretty low-end. It might be I write a more comprehensive article later. And–how do I send pictures? You are welcome to copy from my blog posts (historyLosAngeles.blogspot.com), but I have photos of 2121 Torrance Blvd. that I haven’t posted yet. Thanks! I’ll contact you on the photos, and add them to the address list. I have posted three articles regarding the upcoming Sheets exhibition at the Pasadena Museum of California Art. I hope you will find them interesting. Thanks! I will add it. 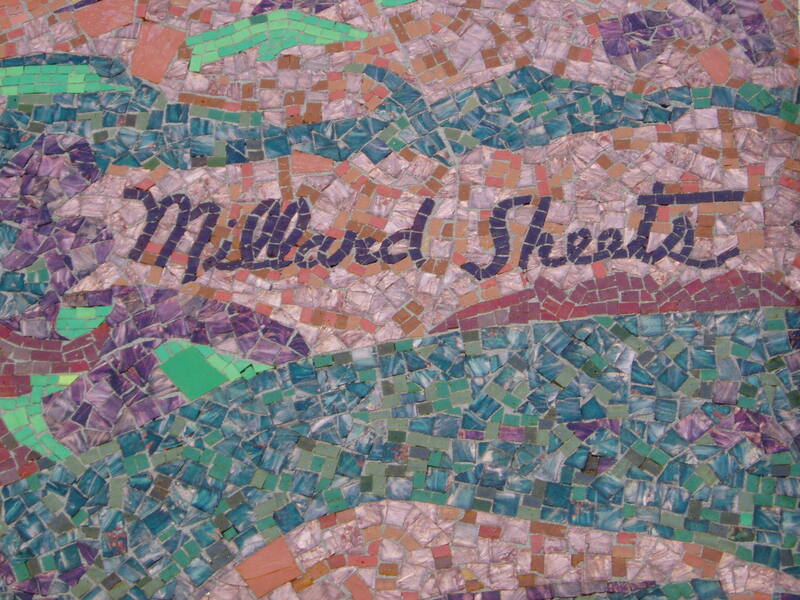 I came across a reference to a Millard Sheets Mosaic on the 21st floor of the Westwood Towers at 1100 Glendon. The reference was in the Los Angeles Times of June 16, 1967, when that location was the Westwood Tower Club, a pretty swanky place to eat. The location is now LEK Consulting. Since it’s Friday evening, no one’s answering the phone so I can’t ask if there’s a mosaic in their offices. I was just in Coronado, CA, where I saw an unoccupied former bank which must have been a Home Savings. It had a mural that looked like something by Millard Sheets. It was located at 925 Orange Avenue. There is also a very well-preserved old Home Savings at 1402 Lincoln Avenue in San Jose, CA. Thanks for those. I will go check out Coronado when I am back in San Diego this summer. Just noticed that the Smithsonian lists an office building at 655 E. Foothill Ave in Claremont among Millard Sheets’ works. I no longer live in the area, but I called the Claremont Eye Assoc (current tenant). The receptionist tells me there are actually two small buildings at that address, and there are mosaics over one doorway. Something to be added to the list? Very possible the Library of the Claremont Colleges has pictures, but I haven’t checked. Thanks! Google’s images do not reveal it, but I will list it based on your call. Thanks, Tony, for writing in. I would be happy to give you a platform to say more about successes and failures in preservation, whenever you find time to write it. Thanks for getting in touch, and for your knowledge about the mosaics. Watch http://en.wordpress.com/tag/home-savings-and-millard-sheets/ for updates coming soon — about my pending move to LA, and upcoming presentations of my research. 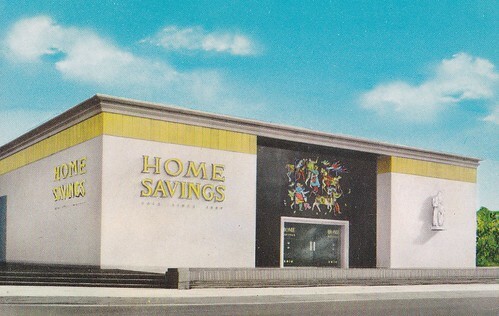 Offering postcard image of Home Savings branch in Buena Park. Building still exists at 8010 Beach Blvd. A couple of corrections for your list: the Buena Park location at 7964 Beach Blvd is still a Chase Bank. It is located across the street from a former HS&L at 8010 Beach Blvd which still has a mural out front. It’s now a store called Attic. The original HS&L at 3731 Wilshire Blvd was demolished, but the new building in its place does have a Chase Bank with artwork that may have come from the old building. The original HS&L at 654 S Figueroa was demolished, but the new building in its place now houses a Metro station entrance and HSBC bank (now 660 S Fig) with murals on two sides. The bank has at least one mural inside, and the Metro station has several murals in the ceiling as you enter. I’ve been taking part in the LA Conservancy’s efforts to document the HS&L’s artwork. The location that seems to be in the worst shape is in Compton at 1801 N Long Beach Blvd (1958). It’s now a stereo shop. Someone painted epoxy over the murals in front, and that is deteriorating and flaking off. Thanks for the corrections; I will put them in the list. PDQ, I’ve recently been to the former HS&L at 249 E Ocean Blvd in Long Beach. There’s no sign of the mural. Thanks for the second Long Beach address — I’ve not seen that listed anywhere before. Also, I’ve seen a lot of sites that give a 1953 date for the Beverly Hills branch, however, the mural is dated 1955, and that’s what the city tax records indicate as well. If you go to the lottaliving forum mentioned above, you’ll find addresses and photos of over a dozen locations with art that I don’t see here, including Alhambra, Burbank, Downey, Huntington Park, Lakewood, La Mesa, La Mirada, Monterey Park, Northridge, Rialto, Tujunga, Westminster and Woodland Hills. I worked for Home Savings from 1991-1999. The entrance to the corporate headquarters building in Irwindale had two mosaic panels by Susan Hertel. I was told these panels came from the Long Beach branch when it was closed. When Home Savings was bought by WaMu, I was contacted by two ladies from Claremont Scripps College. They were interested in the Millard Sheets and Susan Hertel artwork, because of their involvement with the college. I got approval from the company to donate the two Long Beach panels to the College, but the college had to raise the money to remove the panels and install them in the new location. I was laid off in June 1999 and don’t know if the panels ever made it to Claremont Scripps. Thanks — I will look into it. I will update it. Does FirstBanks have a preservation and care plan? Soon I will have a database listing all the works’ current status. Thanks for those links — the consolidation list is an especially good find. I will add it in with the list of known Sheets projects, and we should have a good “punch list” of which sites need to be investigated for saving. As for preservation, these are *should* be covered by state law — but the owners are not always aware of this. Adam, I googled your website after reading Vickey Kalambakal in Westways. I am Howard Ahmanson Jr., the only child of Howard Ahmanson, and I’m quite concerned that these things be preserved. Yes, you may try to contact me! I travel a lot, but I usually keep up my e-mail! Thanks very much for checking in! I will be contacting you by email soon. Sarah, the Northridge HSL is still there. Further research finds that my treasured 3rd Ave.@ El Camino Real mural is not an HS site. A cityartssanmateo.org brochure credits BofA: “#15. Untitled designed by Louis Macouillard executed by artisan Alphanso Pardinas. Five mosaic murals, spanning 25 feet, created as tribute to Bank of America founder A.P . Giannini and symbolically representing the bank’s history .” Rather than disappointed, I am more intrigued about the public art contributed by banks, in an era when these institutions were truly a part of their communities. Yes, this intersection is precisely my interest, and I do hope to learn more about public art on banks, whether it was Home Savings and the Sheets studio or others. Style: Art Deco. Architect: Dennison & Hirons. At the corner of West Portal and Vicente, in San Francisco, there is an old Home Savings, now a Chase, with a large Sheets mural over the front door.